I finally went to Millers Farm, a farm not far from my house, to buy vegetables. WHY HAVE I WAITED SO LONG?! 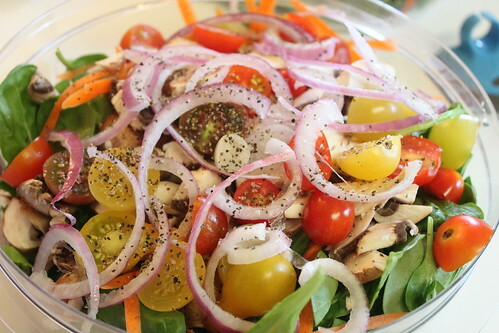 This salad might’ve been my best salad of the year all because of the incredibly fresh and delicious produce. Their tomatoes were like little round bites of heaven. Seriously. 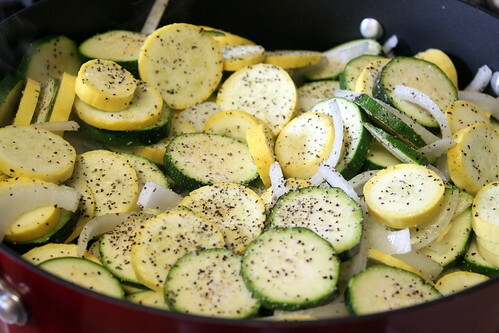 While I was at the market I picked up green and yellow squash to cook for my Mom. She broke her ankle a few weeks ago and I have been working from her house and trying to cook a few things for her so she could have healthy options. She requested squash and I’ve never cooked squash. I’ve eaten it but never really cooked it (the husband isn’t that big of a fan). So I took my mother’s directions: cut it up evenly, add onion, salt and pepper and let the squash produce it’s own juices and you’re good to go. It was quite yummy if I do say so myself. So now I’ve checked 2 food items off of my 33 in 33 for 33 list. YAY ME!